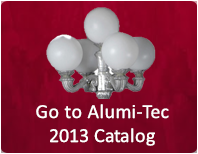 Alumi-tec is a manufacturing and distribution company. We offer an extended line of products built in cast aluminum, which is rust free, strong enough for outdoor use, and lightweight enough to make installation easy. It is our mission to offer quality products at the best price available to distributors, retailers, and even wholesalers so they collaborate to enhance the beauty of American houses, businesses and streets. We offer a wide variety of products such as patio furniture, outdoor period lighting lamps for residential and commercial use, mailboxes, decorativer urns, planters, fountains, wall sconces, walkway lights, statuary, which includes an amazing collection of animal statues, antique reproductions and, of course, we can make custom orders and help you create a new product. We are located in both sides of the border between Mexico and the USA. Our factory is located in Juarez, Mexico and from there we take our products to El Paso, Texas, where we have our showroom and distribution facility. From this location, we are able to offer very competitive prices and fast shipping. And, depending on the size of the order, we can also offer delivery, where we make sure that the merchandise arrives in good conditions to its final destination. Our products are currently selling to the public through retail stores, contractors, and distributors located throughout most of the 50 states of this great nation.